I love everything about apple season from the bowl of fresh apples on my kitchen counter to the trips to the apple orchard with my family. 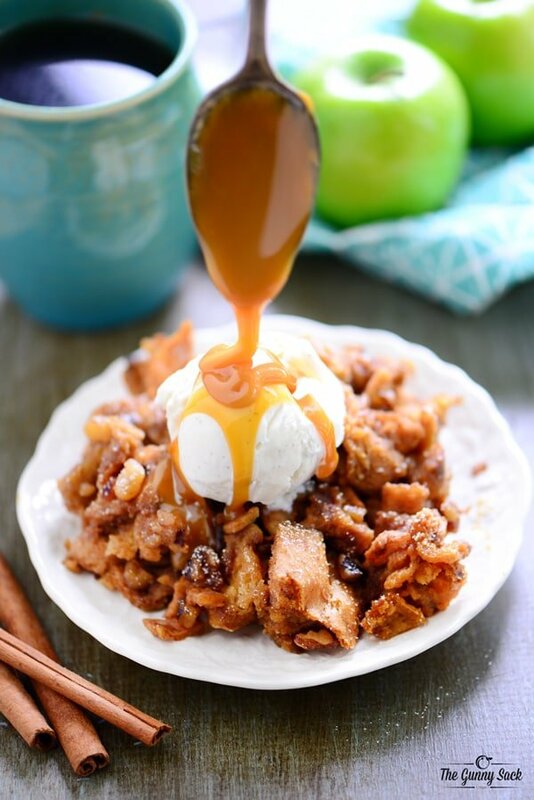 And I especially love apple desserts which I’m sure you’ve noticed by all of the apple recipes I’ve shared already this fall including Caramel Apple Cupcakes, Caramel Apple Fruit Pizza and Caramel Apple Pretzel Salad. 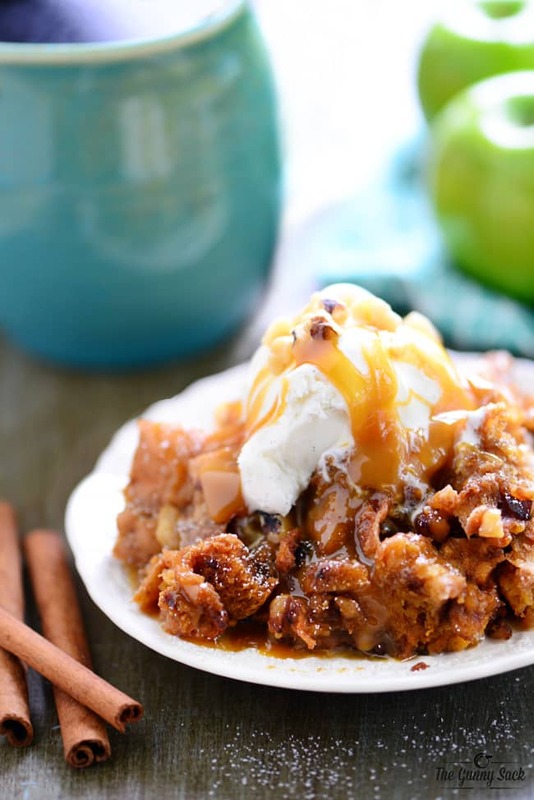 I’m also getting the impression that caramel apples are very important to me so it should not come as a surprise that today recipe for Slow Cooker Apple Walnut Bread Pudding also includes caramel! Mix together the granulated sugar and two teaspoons of cinnamon. Sprinkle it over the diced apples and stir to coat. Set aside. In a separate bowl, whisk together eggs, half-n-half, apple sauce, caramel ice cream topping, brown sugar, vanilla extract, two teaspoons of cinnamon, nutmeg, and salt. I used my 6-quart CrockPot for this blog post, but I’ve also made it in a 3.5-4 quart size CrockPot. Make the bottom layer in a greased CrockPot (or even better, use a slow cooker liner if you have one because it makes clean-up so much easier) by spreading four cups of the cubed bread on the bottom. Sprinkle with one cup of the diced apples and a quarter cup of the chopped walnuts. Pour half of the egg mixture over the bottom layer. Make the top layer by adding the remaining ingredients in the same order. Gently stir everything to coat the bread with the egg mixture. Cover and cook on low for 3-4 hours or until a knife inserted in the center comes out clean. Uncover and cook for 10 minutes to help absorb any extra liquid. Serve warm with a sprinkle of powdered sugar, a scoop of vanilla ice cream and a drizzle caramel topping. 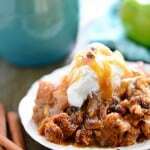 You can put this Slow Cooker Apple Walnut Bread Pudding cooking a few hours before dinner and once everyone is done eating, dessert is warm and ready to go. All you need to do is grab the ice cream from the freezer and serve the bread pudding! You could also make this slow cooker recipe for a holiday brunch because it is essentially the same thing as French Toast Casserole. Serve it with maple syrup and fresh whipped cream. 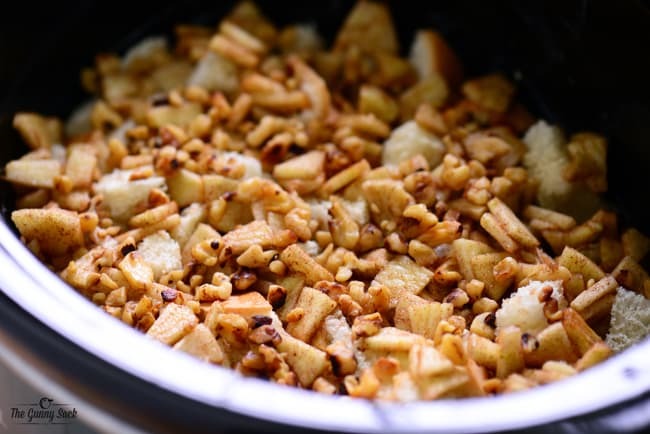 Whether you make Slow Cooker Apple Walnut Bread Pudding for dessert or for a holiday brunch, the warm comfort of baked apples and custard-like bread will make everyone happy! Mix together the granulated sugar and two teaspoons ground cinnamon. Sprinkle it over the diced apples and stir to coat. Set aside. Make the bottom layer in a greased slow cooker by spreading four cups of the cubed bread on the bottom. Sprinkle with one cup of the diced apples and a quarter cup of the chopped walnuts. Pour half of the egg mixture over the bottom layer. Make the top layer by adding the remaining ingredients in the same order. Gently stir everything to coat the bread with the egg mixture. Cook on low for 3-4 hours or until a knife inserted in the center comes out clean. Uncover and cook for 10 minutes to help absorb extra liquid. Serve warm with powdered sugar, vanilla ice cream and caramel topping. If you do not have day-old bread, cut bread into cubes and bake them at 325 degrees for about 5 minutes on an ungreased baking sheet. Thanks for the recipe, Love apple pie and bread pudding what a great combination. Its in the crockpot as we speak, can’t wait to try it! Easy gorgeous crockpot desserts are simply amazing! I can picture this for Christmas or Thanksgiving morning. I totally agree! Thanks, Laura! This is GORGEOUS. Also? Slow cooker desserts rock! I love that last photo where you are drizzling on the caramel! Thanks so much Maryanne! Good thing for tripods, right? My goodness, this looks downright heavenly! The shot of you drizzling the caramel….swoon! Thanks Ashlyn! I love warm comforting dessert and then the ice cream and caramel make it even better! This is awesome! Looks so tempting! The vanilla ice cream and caramel on top made it perfect! Great photos too! Thanks Andi! It’s my favorite way to eat it! I am so glad that apple season has arrived! 🙂 And bonus for being a slow cooker dessert! I use my slow cooker so much during the fall for like everything. Can’t wait to give this recipe a go soon! My too! I love fall and I love using my slow cooker! Thanks, Carrie! 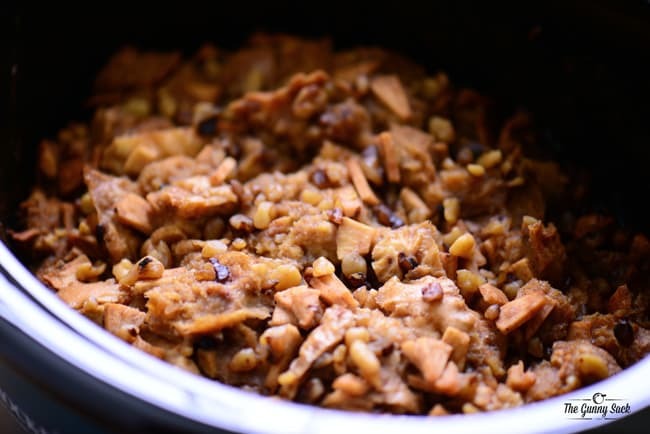 Just stunning, Tonia – it’s fall in a slow cooker! Yes it is and it’s my favorite season! Thanks so much, Melanie! I can’t get enough fall apples lately! This bread pudding looks like a great way to use them! I totally get it! I’m eating fresh apples for snacks and in salads but I’m baking up a storm with apples and loving every minute! Thanks, Jessia! It’s such a simple, classic dessert but so yummy! Thanks, Lisa! Love this recipe. Thank you Tonia. Have a good week. It’s been a busy week but a great one! We are really enjoying fall in Minnesota. Thank you so much, Liz!